The weather is dreary and we at CatSynth are tired. So the best thing to do is curl up and relax. There is a lot we can learn from Sam Sam’s example of napping in the face of fatigue or cold. Today I am more tired than usual, but for good reasons. We had a successful Pitta of the Mind show last night. It was all new pieces and the performance went off without a hitch – except for my psychedelic lighting unit not switching on – but we ran with it and had a great audience experience. Today, we simply take it easy and figure out what’s next. This is the goal, other than exercise, mental exploration, and creative pursuits. There is another performance tomorrow (an improv duo), but other than that we should be largely on our own. Something I think Sam Sam appreciates. We hope you all have a good weekend, wherever you are, whatever you do, and however the weather is treating you. It’s been a busy – and cold – time at CatSynth HQ. So it’s not surprising that human and feline alike are seeking warmth and comfort. Sam Sam has taken to sitting on my side of the bed, even rushing to grab the warm spot when I get up. In the photo above, we see her enjoying a bit of posh comfort on fluffed-up bedding. It’s good to be the cat! She especially likes it when I leave dirty clothes there, as it adds my scent. I came home after a long day at work to find her curled up on top of them and quite contented. I suspect she was a little lonely during the day, and perhaps a bit cold as well. It’s been a dreary February, as we have stated before. But it drawing to a close next week, and the skies are becoming a bit brighter. We at CatSynth look forward to the arrival of spring (honestly, it can’t come soon enough). It happens almost every year. After returning home from NAMM, a few days later I fall ill with what we affectionately call the “NAMMthrax”. I suppose it’s not surprising, being in close quarters with thousands of musicians and others over four days and compromised immune systems from all our drinking and debauchery. This year’s hit hard around Wednesday, and has lingered into the weekend. But fortunately Sam Sam is here, and being both a great companion and a great nurse. When I lie down to rest, she is usually by my side. Of course, being a cat, she takes frequent naps herself. There is something so peaceful and calming about her curled up and resting. And it seems to fit well visually and spiritually with the stormy weather that has settled in this weekend. Since December, we have been hit with a series of really nasty winter storms with high winds and flooding. It is not pleasant, and sometimes even stressful, but I know I shouldn’t complain as much of the country is in a deep freeze. I like this portrait of Sam Sam sitting down in “loaf” pose on the ledge. And if you want to see a bit of action, here she is in our most recent Instagram. We hope you all have a warm, dry, and safe weekend. More post-NAMM coverage on the way soon. Happy 2nd Gotcha Day, Sam Sam! It’s been exactly two years since Sam Sam made the long trip from southern California to come live with us at CatSynth HQ! And not a day goes by that we are not grateful to have her in our lives. I’m pretty sure she feels the same way. Samantha, or “little Sam Sam”, had a complicated life. She started out (as far as we know) in the suburbs south of San Francisco, and then moved with her human to the high desert north of Los Angeles – we like to joke that she lived “out in back of Palmdale where the turkey farmers run” in tribute to one of our musical heroes, Frank Zappa. When her human passed away, she then went to live with his sister, also in southern California. Unfortunately, the sister’s health was declining and another cat bullied Sam Sam, so this was not a happy chapter for her. 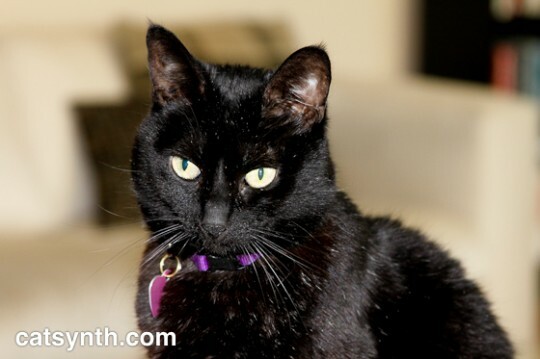 As her new human was preparing to go into assisted living, Sam Sam needed a new home. In December of 2016, I was still deeply grieving after Luna’s death – and also reeling for the shock and horror of the election. I hadn’t yet prepared to welcome another cat into my life, but when a friend and bandmate reached out to me that he needed to find a new home for a sweet cat whose human was headed to assisted living – and then shared her adorable photos, I said yes. How could I not? At first, Sam Sam was exceedingly shy and skittish, spending most of her time hiding under the bed, coming out only for food, water, and the litter box. She was mostly silent but occasionally emitted these tiny squeaks. As she adjusted to her new home, her personality blossomed. She’s quite friendly, vocal, outgoing, and quite a ham. And she has no trouble demanding exactly what she wants from her humans. 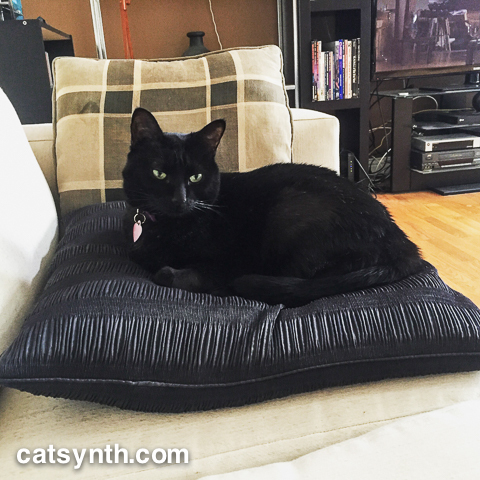 We close with this episode of CatSynth TV featuring Sam Sam is all her adorableness. Please join me in wishing Sam Sam a very happy Gotcha Day! Sam Sam continues to delight every day with her adorable antics. And she certainly gets lots of love and attention in response. It’s interesting to see how different her unique facial markings look from different angles. Of course, being the constant center of attention can be quite exhausting, so there is always time for naps. Sam Sam often sticks a paw on her tail while sleeping, a trait we have remarked on before. I don’t know whether it serves a purpose or is just a quirky habit, but it is very sweet. Today is #BlackCatDay, and an opportunity to celebrate and recognize black cats as we close in on Halloween when stereotypes and threats sometimes reach a crescendo. It breaks our hearts to think of any cat being hurt or abused, but black cats can face an especially different time. For years, the celebration of black cats on and around Halloween was a ritual, with Luna often hosting the special Halloween Black-Cat Edition of Weekend Cat Blogging (back when that was a shared thing). Now it is more a time to remember and reflect on Luna, who left us on October 31 two years ago. We will have a proper remembrance on that day, but for now, we just want to bask in the beauty of our beloved black kitty. Sam Sam is not amused. Our feline neighbor is back and enjoying himself on one of the terraces behind CatSynth HQ. You can see his face through the glass bricks, albeit in a Cubist sort of way. Nothing wrong with his being there. I for one love to see cats enjoying themselves. But his presence brings out both Sam Sam’s curiosity and territorial instincts, and she was quickly back up on the ledge to investigate – and to assert her territorial claims. We managed to capture a bit of it in this video. It definitely makes a bit nervous to have Sam Sam up there, but there really is no stopping a determined cat. It’s also a reminder that I need to replenish that wine rack. The one bottle that remains is from Armida Winery, whom we featured in a CatSynth video back in June. It’s been almost a month since our last check-in with Sam Sam on these pages, and that is too long. And she is expressing her desire that we give her the attention she deserves. If you have seen any of Sam Sam’s videos on Instagram or YouTube, you know she is quite the talker. Usually, it’s her tiny raspy mew, though her voice occasionally blooms into full-blown arias. This is a good time to remind folks that you can follow her antics regularly on our Instagram @catsynth. Please do follow us if you feel so inclined. The main rug is definitely one of her favorite spots and shows evidence of her frequent scratch’n’rolls. Honestly, we don’t mind as we delight in her antics. But it does require vacuuming, which is on deck for today. I know she is not going to enjoy that, but it is necessary. Fortunately, she has other spots to enjoy around HQ, including this comfy chair in the loft. We hope you all have a relaxing and enjoyable weekend.